When Arthur Laurents' beautiful revival of West Side Story soars, it flies so high that you practically can feel yourself being lifted out of your seat. With Leonard Bernstein and Stephen Sondheim's timeless score and Joey McKneely's lovingly recreated choreography from the show's original director Jerome Robbins, how could it not? I was practically moved to tears many times by the amazing vocal talent Laurents amassed. In particular, Matt Cavenaugh's Tony was especially angelic. And the captivating Josefina Scaglione as Maria makes for a most auspicious Broadway debut. But the conceit of this revival, of course, is its ultimately frustrating use of Spanish language to tell the Sharks' tale. While I laud Laurents for daring to break new ground by having his Sharks speak their native tongue from Puerto Rico, so much was lost in translation -- or complete lack thereof -- that this conceit gnawed at me as highly arrogant. Had Laurents done for his audience what opera has done for years -- providing subtitles of some sort -- he would have had no bigger advocate of his otherwise sparkling revival than I. Instead, I left feeling cheated and very disappointed that I only got one side of this story. On Friday, you and Sarah said that you prefer it when people form their own opinions instead of blindly agreeing with your assessment of a show. Then you expressed your concern about the language barrier in WSS, but Sarah said that it shouldn't be a problem even if you didn't know Spanish. And then you write your review explaining that you "felt cheated and only received one side of the story" and gave WSS 2.5 stars. Chelsea, Make no mistake that my 2 1/2 star review still means I believe it's worth seeing. 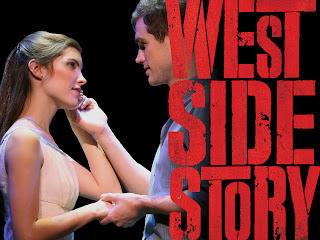 I'll look forward to learning what you think about West Side Story once you've seen it for yourself. Steve, my husband and I totally agreed with your review, and had stated the exact same sentiments. I'm still happy that we saw it and enjoyed the music as much as ever, but I spoke to a friend who doesn't want to see it because she thinks it will annoy her. Having been raised to be PC all my life, I had a hard time dealing with my thoughts about this. I agree about feeling cheated in not being able to understand some of the dialogue. I also thought it a great mistake to present "A Boy Like That" in Spanish. Those lyrics are important to the story. Except for Karen Olivo and a few of the Puerto Rican girls, I thought the cast lacked energy. Should you see it? Absolutely. It's classic Broadway. And the stunning recreation of Jerome Robbins original choreography is well worth the price of the ticket. Steve, that last comment was from me, Suko. Political correctness has nothing to do with constructive criticism of the conscious decision by Arthur Laurents to make a significant portion of his own book unintelligible to those in his audience who are not bilingual. Oh how I wish I still could speak enough Spanish to get by. But I don't, and this audience shouldn't have to strain its ears trying to remember, either. My practical solution of providing sub or overtitles would have significantly enhanced my personal enjoyment of this effort. Suko, I agree with you completely. This show still deserves an audience, if only to hear those timeless classics and witness Jerome Robbins' brilliance as a choreographer. Steve, I understand they tried using subtitles on screens in the D.C. previews but decided to scratch it because the audience was finding it too distracting. Thanks Suko. I had not heard that. Although I have to say, when I saw La Boheme on Broadway earlier this decade, their use of onstage subtitles was very effective. I love watching films with subtitles and am never distracted by them but I know people who are. My husband for one. Steve, have you seen "Everyday Rapture" with Sherie Renee Scott? It's my favorite show since "Spring Awakening". It's at the Second Stage Theatre until May 31st. If you haven't seen it, do go. I think you'll enjoy it. I usually agree with your critiques and hopefully you will agree with me. It's Broadway-worthy in my humble opinion. Thanks for the recommendation, Suko. She's certainly among my favorite stage actresses - love her voice. I'd see her in anything. She's dazzling!